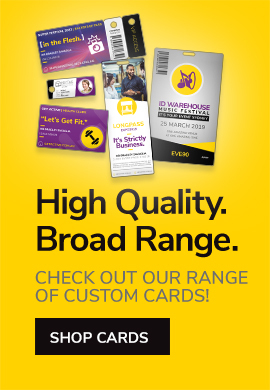 From strengthening security to improving identification, ID Warehouse explores the top reasons why customising visitor management, access cards, and people identification products help create safer environments for everyone. From branded event lanyards to corporate card holders, customisation helps mitigate the risk of uninvited visitors using false identification to enter your premises or venue. Recipients of your organisation's branded ID products may feel an increased sense of responsibility to look after their safety, the safety of others and the security of your premises. Branded staff lanyards, name tags, and card holders help visitors, delegates or partygoers quickly identify your employees. They also assist staff in locating other employees, which is particularly important in crowded and busy situations. Staff and visitor identification cards or lanyards are the ideal canvases for printing safety and security reminders to protect your people and premises. Branding an ID product with your logo or event name creates an important first impression and visibly underpins your organisation's culture of safety and security. There is no doubt that customised ID products enhance people's perception of your organisation and raise your safety and security credibility. Whether you're looking to brand an identification product or you need an end-to-end tailor-made solution, our expert customer service, in-house design, and production teams are at the ready to help.